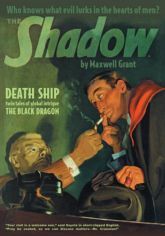 The Knight of Darkness battles foreign threats to America in two classic pulp thrillers by Walter B. Gibson writing as "Maxwell Grant." First, with his alter ego compromised, The Shadow rises from the deep Pacific to confront Japanese agents and retrieve the U.S. Navy's prototype Z-boat, a submersible "Death Ship" that could tip the balance in the future war. Then, at the height of World War II, The Shadow and distaff aide Myra Reldon combat the treacherous plots of "The Black Dragon" and his sinister secret society. BONUS: "The Man with The Shadow's Face!" This instant collector's item reprints Graves Gladney's and Modest Stein's first Shadow covers in color, plus the original interior illustrations by Edd Cartier and Paul Orban, with commentary by Will Murray.